Cushion cut or Princess cut? Something as simple as selecting a gemstone shape can actually be a difficult choice. While round gemstones will always be a favorite, different cuts, such as the cushion and princess cuts, have surged in popularity. Below, we’ll cover the defining features and properties of these two cuts, and each cut’s potential to transform a ring’s appearance. What’s the difference between a cushion cut versus a princess cut? 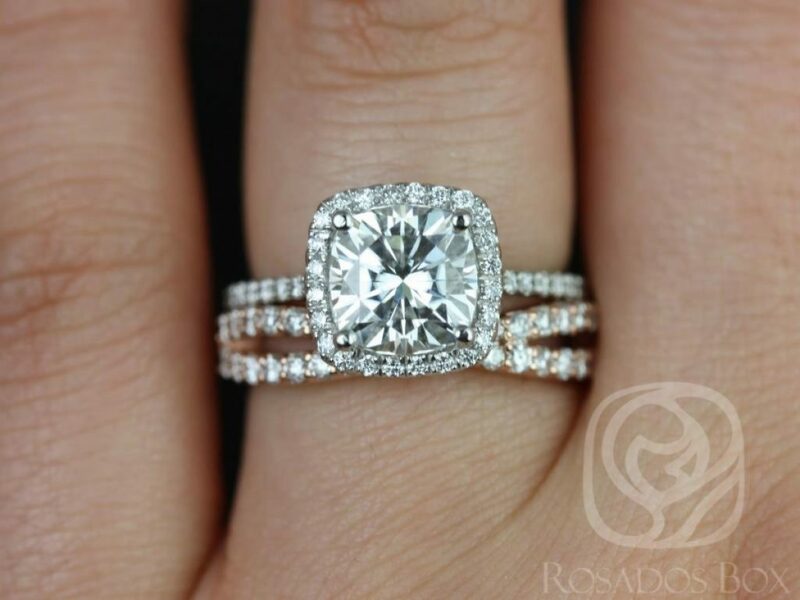 Both the cushion cut and princess cut roughly resemble a square shape, but the similarities end there. Each shape has a few subtle differences. The cushion cut features softer, more rounded corners, creating a more elegant and romantic style. 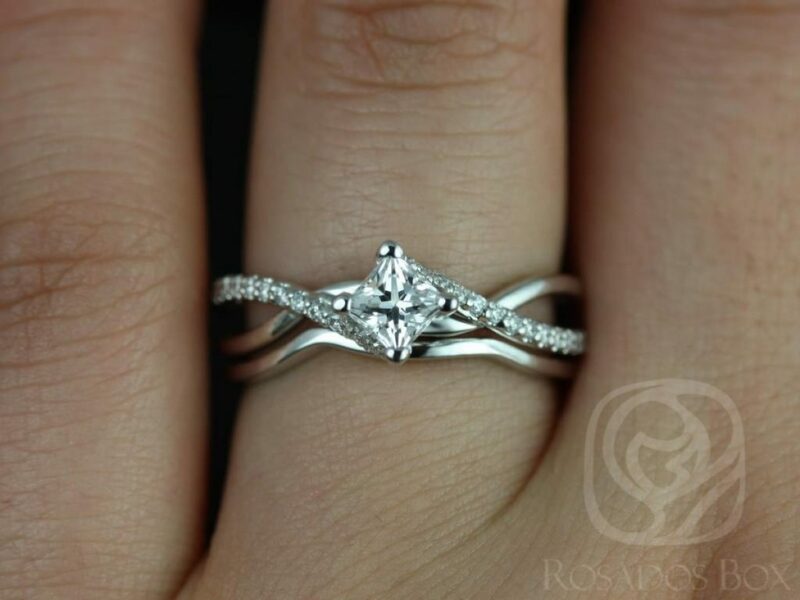 The princess cut, on the other hand, features edges that are straighter, creating a convex, “pushed-in” look. The Cushion cut, formerly known as the old mine cut, resembles a softer look, hence the name “cushion. Originally introduced in the 1800s, Cushion cut gemstones were actually the most common shape until the 20th century when the round cut took over in popularity. Since then, the cushion cut has remained popular for its antique feel. Even cushion cut gemstones can come in different shapes and sizes. Some may appear more rectangular, while others are closer to squares. Check out our Rosados Box Randi 9mm 14kt White Gold Cushion Cut F1 for a classic example of a stunning cushion cut engagement ring. With a Forever One GHI Moissanite by Charles & Colvard, this ring is sure to turn heads and create timeless memories. For a slight twist on the same concept, check out the Rosados Box Catalina 7.5mm & Lima Platinum/14kt Rose Gold Cushion F1. This ring’s band features rose gold and resembles an infinite loop. In contrast to the Cushion cut’s antique look, the Princess cut has a far more modern feel. Instead of softened edges, the Princess cut has distinctly pointed corners and a geometric appearance. First seen in the 1960s, the Princess cut was originally called the “profile cut” and even the “square modified brilliants” due to their similarities with round brilliants. For a great example of a Princess cut wedding ring, take a look at our Rosados Box Valentina Valentina 4mm 14kt White Gold Princess White Topaz and Diamond Twist Wedding Set. With an iconic twisting band design and a modern take on a traditional gemstone, this is a ring fit for the times. Also, make sure to take a look at the Rosados Box Valentina 4mm 14kt White Gold Princess White Topaz and Diamonds Twist Engagement Ring. It’s the same beautiful design adapted for an engagement worth remembering. Explore our Cushion cut, Princess cut and other beautiful rings for engagements and weddings. 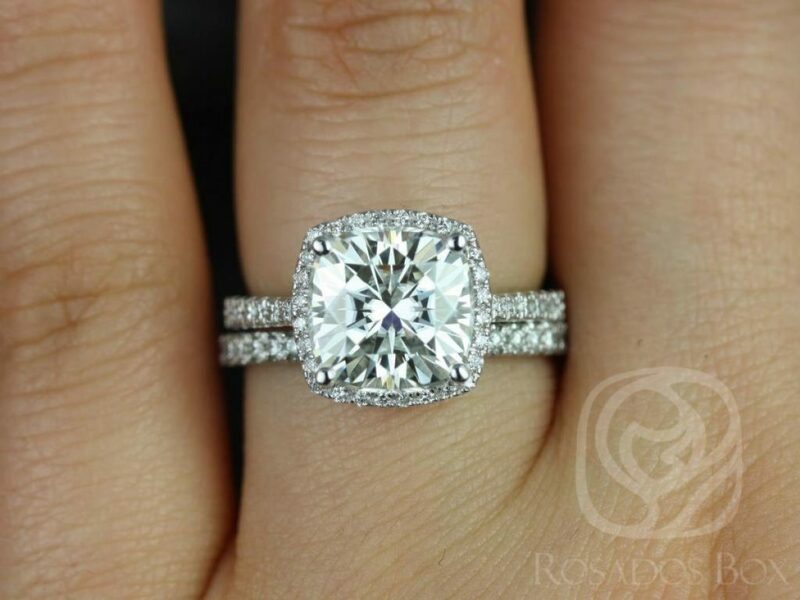 Cushion cut rings can create beautiful engagement or wedding rings. With its soft, rounded-off edges, the cushion cut is perfect for a more original design. If you want something more unique than the traditional Round cut or Princess Cut, then Cushion cut is the way to go. Some have noticed that Cushion cut gemstones appear slightly smaller than those with the Princess cut and Round cut. We recommend looking at slightly bigger gemstones to offset the illusion of a smaller cut. 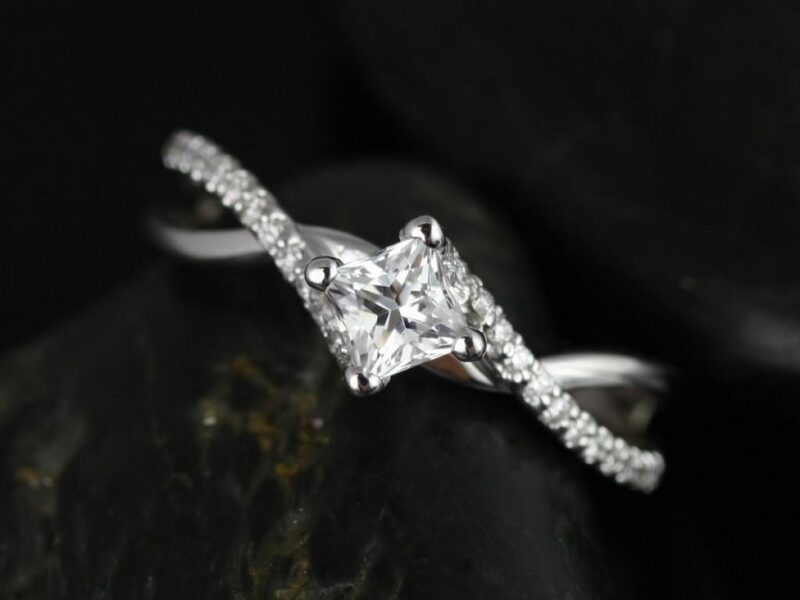 If you want something more modern, you can’t go wrong with the Princess cut. The sharper edges tend to create the appearance of a bigger gemstone and a more royal and lavish feel. On top of that, Princess cuts can have a greater fire than other cuts and hide blemishes better than Round cuts. Princess cuts work especially well when set in a solitaire or with a halo of gemstones. One potential concern may be the corners of the Princess cut, which some have considered being damage-prone. While almost all gemstones are potentially vulnerable, we recommend paying extra attention to the setting options to make sure the gem’s corners are either covered or protected to prevent any wear. It can be difficult to determine which cut is more cost-effective, as other factors, such as the gemstone, carat size, length to width ratio, and color can all affect the price. Both are more affordable than their Round cut counterparts, but the Princess cut has quickly become the second most popular cut, even leading to sold-out stocks in-store. Generally speaking, the Princess cut should be more affordable, but once again, it is important to evaluate the jewelry from multiple perspectives. 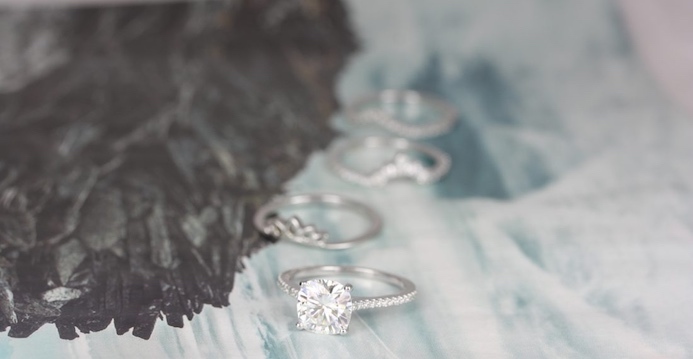 Need help deciding between a traditional engagement ring design and a more modern one? Be sure to read our previous post: From Traditional to Fancy. « What is a Moissanite Diamond?